Have you ever wondered what information you can and should use to create a comprehensive journey map? This article introduces you to the most important details of a journey map and explains how adding different lanes can help you illustrate experiences. Visualizing a complex thing like customer experience is challenging and many people feel lost when they need to make a decision on how to illustrate important moments of the customer journey. Journey maps can be enhanced by a variety of optional visualizations, so-called lanes, to create depth and meaning. In this article you get to know a few of the lane types that help you highlight specific aspects of a customer journey and create a comprehensive customer journey map. Stages and steps define the basic structure of an experience. What are your persona’s experiences along the service? A step is like the title of an experience. In a journey map, each step (often also called touchpoint) is written in one horizontal row. Various steps can form one stage and group them into different phases. For example: the illustration above shows five steps (or touchpoints) a customer undergoes in order to get to his favorite café. The five steps can be categorized into two stages: Pre Coffee at home and Heading to Café Bean. Various visualizations add the actual content – the experience and story of a persona (i.e. the main actor of your story) with all its facets. A simple text lane allows you to describe each step in more detail. You can add various text lanes according to a project’s needs: add a to-do list, write up research insights for each step, all notes about what other sources and documents are relevant. interfaces, or just quick scribbles visualizing specific situations. Visuals for each step help not only to understand the context of each situation, but also gives a comprehensive overview of the whole journey and quicker navigation. Often, the steps of a journey map and a quick storyboard is all you need to create a journey map that is comprehensive and engaging. A channel lane gives you a comprehensive overview particularly for high-level journey maps. Specifying the channel (e.g., face-to-face, telephone, online, etc.) a customer uses at each step helps us understand cross-channel experiences and potential gaps regarding cross-channel experiences. By looking at both online and offline channels, you make sure to include all aspects of your customer’s experience, who also perceives your company as one entity and does not differentiate between different channels. Moreover, a list of alternative channels allows you to compare experiences between different channels. For example: it could be a very different experience to purchase a ticket online, on a website or with a smart device, depending on how well the platform is set. of satisfaction at each step. You could for example use a simple 5-point scale from very negative (-2) to indifferent (+-0) to very positive (+2). For example: a standard customer service might be indifferent, a super kind customer service might be perceived as very positive and result in high satisfaction. A dramatic arc is a graph showing the level of a persona’s engagement, arousal or importance at each step on a 5-point scale from very low (+1) to very high (+5). There are moments of “thrill” (i.e. high engagement) and moments of chill (i.e. low engagement) – and both can be positive or negative. Dramatic arcs help us to reflect on the pace and rhythm of an experience. They can be used to analyze an existing experience as well as to plan a future concept along a desired dramatic arc. For example: a low dramatic arc when purchasing a few standard pencils might be good, a low dramatic arc when sitting on a rollercoaster not. needs to invest into maintaining a certain quality of a service. to work on several other steps while they handle the call. Steps like: the digital client database, the logistics department, an external transport supplier and so forth. You can use a file lane to attach relevant documents to your journey map. Be it internal company documents about your workflows or assets generated in a workshop, files can help you provide additional context for each step. Backing up a journey map with additional data and research findings makes it trustworthy and easier to base decisions on the insights. 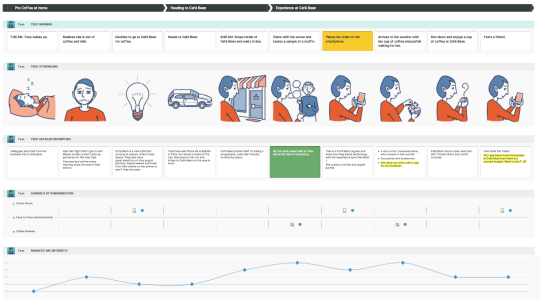 We’ve collected some example journey maps for different industries, including a range of lanes and focusing on various topics.